Galaxy S4 issues are common here at Phone Ninja; both because they are popular, and also because they are quite a weak phone. The main repair we perform at our Perth WA store is Galaxy S4 screen replacements and we fix all versions of the S4 including the i9505, the i9506, the new I9507 version, and the overseas only i9500. So for any Galaxy S4 service drop down to our stores in Perth, contact us, or read on for more details. SPECIALS: Fixed On The Spot! We now offer a glass only Galaxy S4 fix for a fraction of the cost of a full screen replacement. This is great if your touch & LCD are still functioning but look below for more info on Full Screen Replacements. Unlike other repairers in Perth we don’t use backyard repair techniques instead we repair all our screens in a truly dust free environment. We also replace the frame with a new bezel, which is the border around the screen which is always dented giving your phone that new look. The Touch screen & LCD must still be working for this repair. One of the most common Samsung Galaxy S4 repairs we perform is screen replacements. Sadly sometimes the impact shatters the LCD which means a full screen will need to be installed. Common symptoms include no display, a black screen, lines through the display, the touch screen no longer working, and plenty of other symptoms. Thankfully we can fix this Galaxy S4 problem on the spot and often in under 30 minutes. 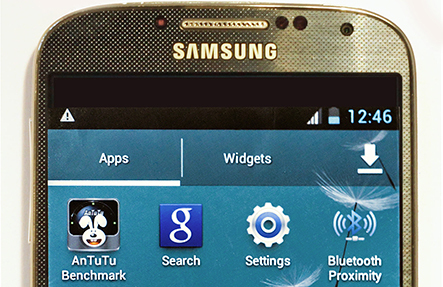 A problematic Galaxy 4 battery can cause many issues; not just the typical draining problem. Other faults include your S4 turning off, charging problems, crashing, and low battery indicators among other signs. Unfortunately these problems can be hard to diagnose, so drop your Samsung phone down to our stores for a diagnosis.